The OMEGA screen is a unique product of its kind, it is characterized by a very large screening surface. 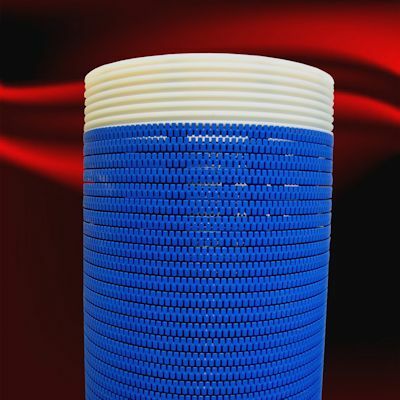 This item is made up of polypropylene knurled rings slipped on to steel rods, which are placed according the generatrices of a cylinder. At both ends the rods are gripped with nuts that hold the rings tight; this structure enhances the screen mechanical resistance (which is already very high) and together with polypropylene anticorrosive features, ensures to this product a long lasting life. The shape of the rings and the way they are put together create slots in both directions (vertical and horizontal), thus producing an open area of 32%. The rings section is “V” shaped in order to avoid clogging and ensure low hydrodynamic drag. The joints are male/female threaded type and are made of Caprolon (Polyammide-6). All metal parts are embedded in the plastic units and do not come in contact with the well environment. The screen has been tested for the European regulation (EU) 10/2011 (use of plastic materials and articles intended to come into contact with food), therefore, it is suitable for drinking water use. The OMEGA screen main application is for water wells construction, but it can be used also for exploration wells and generally speaking in all those conditions that require high yield and remarkable length.